Which is the Simplest, Hassle-Free, Automated P2P Lending Site? Home » Analysis » Which is the Best ‘Hands-Off’ P2P Investment Platform? Which is the Best ‘Hands-Off’ P2P Investment Platform? This posts compares 5 of the best hassle-free, automated P2P lending options. Investor A: Manual P2P Investor. Investor A spends an hour and a half a week logging onto a few different sites and having a read through project proposals and valuations. Once or twice a week they have the frustration of ‘Fastest Finger First’, where a really popular loan is released at a certain time and they have to be as quick as lightning to get a share. They also waste some time manually doing transfers between platforms and their bank. There’s no economic downturn and their hard work pays off with an annualised return/XIRR of 10%, or £1,500. They pay 20% tax on anything above the £1,000 tax-free interest limit which reduces it to £1,400. Total hours spent over the year: 90. In this particular example, net of tax investor A earns an additional £360 for 80 hours more work, or £4 an hour. So, if you want to use an automated, ‘hands-off’, ‘fire-and-forget’ platform, which is the best one? Assetz Capital have 5 different investment products. Of these, there are two of particular interest for hands-off investment. The GBBA account* offers a 7% return with a provision fund to cover against defaults. The GEIA account is almost identical but focuses on green energy investments. Start to earn 3.75% in the Quick Access Account from day 1, even while you are waiting for your investment to be lent out in the 7% account. Loses covered by provision fund. No fee for early withdrawal. Maximum investment per loan can be as high as 20%. Selling out: if there are no investors to take on your loans, you may have to hold them to completion. Some loans are up to 5 years. Assetz Capital’s allocation algorithm means you have many transactional lines for small investments, which makes manual reconciliation difficult. It’s not clear what happens if a loan you hold in a GBBA account defaults: how long until the provision fund will cover it? What if you want to sell out beforehand? Read the full Assetz Capital review here. Bond Mason manage your peer to peer investment across multiple platforms and loan types for a 1% fee. They target a 7.0% return for their investors after fees. Stated historical returns have been above the target 7.0%. From April 2015 to January 2017 Bond Mason state a net return of 7.51% for their clients. They allow you to invest across multiple platforms, some of which you may not be able to register as a private investor on due to minimum investment amounts (e.g. £25,000+). Great customer service (in my experience). Due diligence carried out by Bond Mason to pick only the best loans. You can select a maximum investment of 1% or 2% of your portfolio in any one loan to ensure healthy diversification. Liquidity if you want to sell out early: target is 7-14 days but potentially quicker if you have a small amount invested. Though, this is not guaranteed. There is a lack of transparency as to what exactly you are investing in: you won’t see the platform name or the platform loan reference. Investors have reported mixed experiences with regards to investment speed/cash drag, some not so positive, others very positive. Fund management fee is not tax-deductible against interest income. No ability to customise your lending: can’t specify or avoid certain platforms or loan types. Read the full Bond Mason review here. Large volume of new loans. 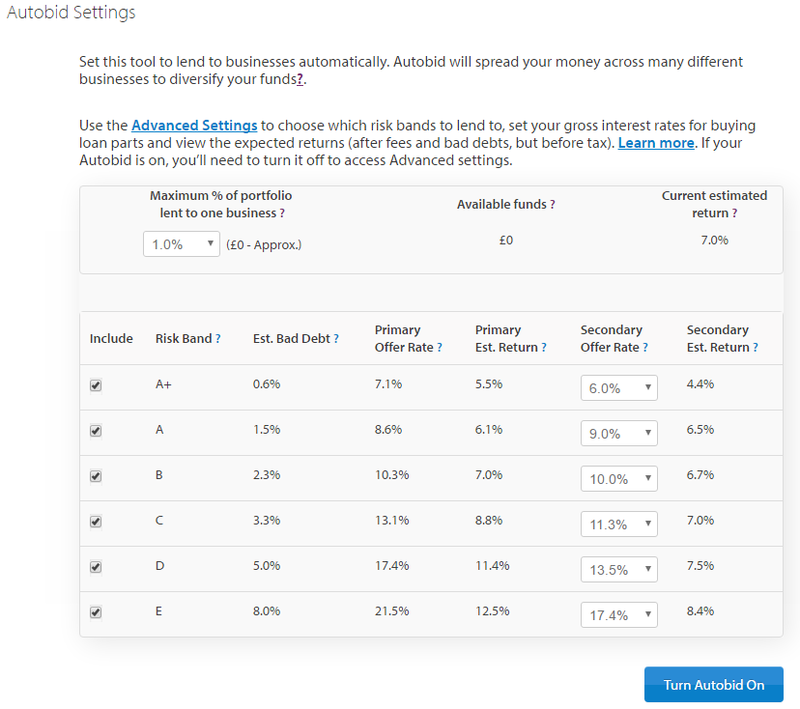 More control over which loans you bid on via settings (as in screenshot above). One of the largest P2P platforms with over £2billion historical loan origination. £50 refer a friend bonus for new users (more info). Massive competition for the most in demand loans, including against selected users who have access to the API and others with custom built bots. Read the full Funding Circle review here. Read the full Growth Street review here. Zopa is probably the biggest name in UK peer to peer lending, with a 12 year history. Access to a breakdown of your personal loan book data. Not covered by the ‘safeguard’ provision fund. 1% fee to sell loans early. The expected rate of return has been steadily dropping, 6.1% is the worst yet. £1,000 minimum investment is higher than some of the others here. Read the full Zopa review here. Note that the Assetz Capital link above, marked with a *, is an affiliate link where we get a small commission if you go on to join and invest in the site. This comparison was written objectively, with the link added as an after-thought.